So, remember how back in January I made an ambitious plan for our DIY wedding centerpieces? Yeah, now that May is almost over, they are finally finished. I confess, the plan was so intimidating that it took me a while to get started. And because making the centerpieces was a multi-step process, it took me a long time to finish them. But the centerpieces are finally complete! Here is how it all went down. 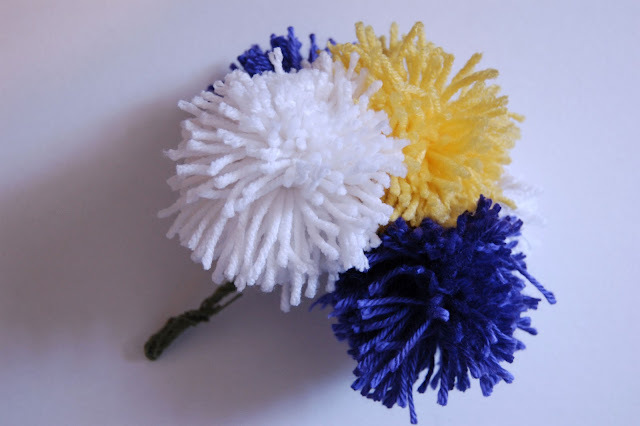 My inspiration for yarn pom pom balls, found here. I had to make six centerpieces, so I used six mason jars (though they came in a pack of 12, which means I had extra left over for other decoration purposes). One bag of pebbles turned out to be sufficient for the six centerpieces, with some left over. I ended up putting five yarn ball "flowers" into each jar, and I used one long stem wire for each yarn ball - for a total of thirty yarn balls, I needed thirty stem wires. They come in packs of twenty, so I bought two. 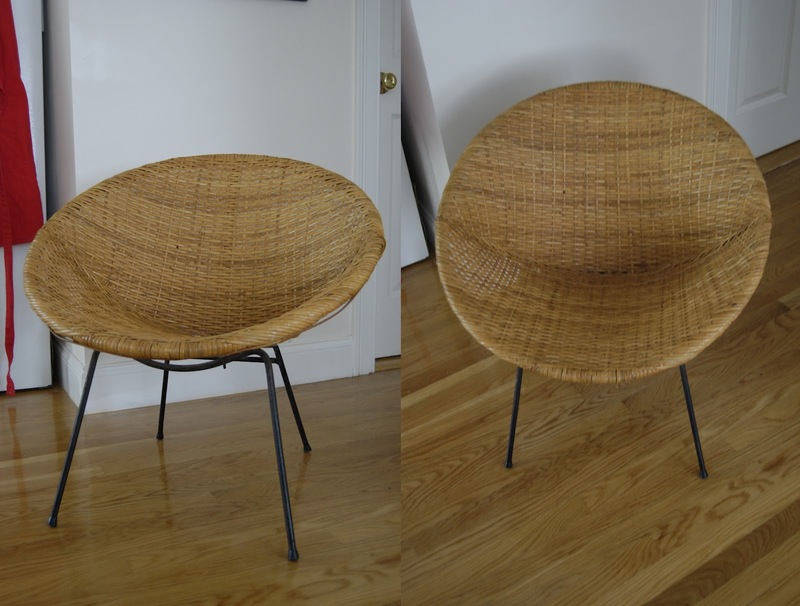 I had no idea how much jute I would need, so I bought several spools, which turned out to be completely unnecessary - all the jute I needed was left over from the wine and beer bottle vase project, and I still had some left from that spool after I was done with all the centerpieces. 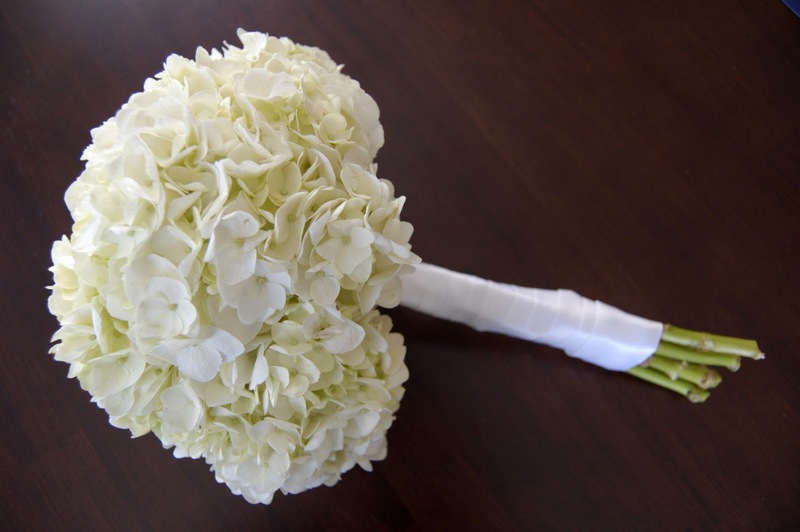 Initially, I wasn't sure what colors I would use, but I definitely wanted to include white in the arrangements. 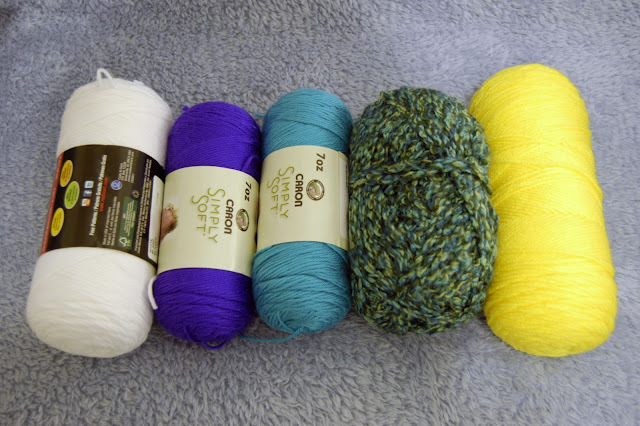 That was the only yarn I had to buy, as I had the other colors left over from other projects. With all my supplies at hand, I was ready to start making the centerpieces. The first step was to make the yarn balls. I followed the tutorial on Offbeat Bride, which is very detailed and nicely illustrated. My only tips would be to use good scissors and wrap more yarn around your fingers than you think you'll need. 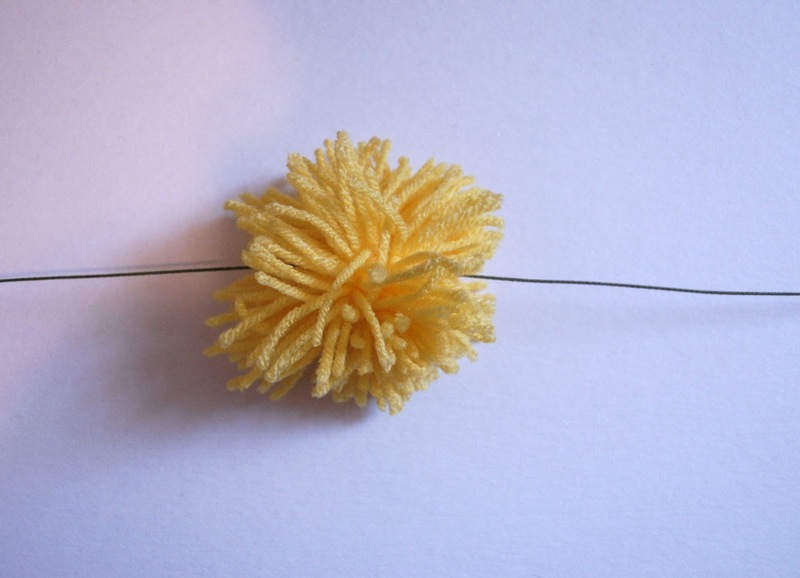 More yarn makes for denser balls, and denser yarn balls tend to droop less. And no, I did not have good scissors, so all the yarn cutting took me a bit longer than it would have otherwise, but it still worked out in the end. During this step, I also chose my colors: white, yellow, and purple. 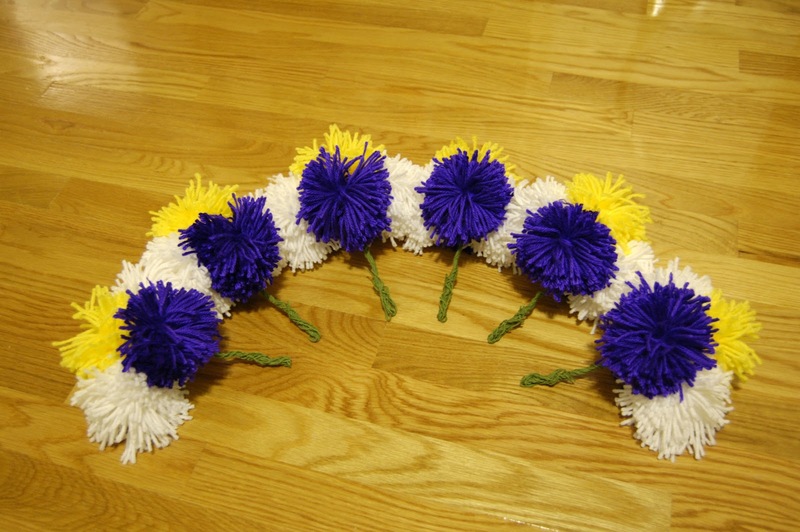 The yellow pom poms became the "flower" centers. 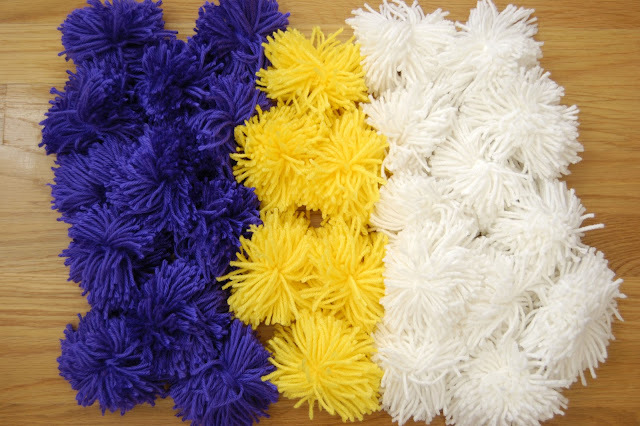 For each centerpiece, I made one yellow, two white, and two purple yarn balls. My camera was having a really hard time capturing the true color purple, so on my monitor, the previous photo (of the yarn supplies) has the more accurate depiction of the color. With the pom pom yarn balls finished, I moved on to making the stems. Originally, I considered somehow gluing or otherwise attaching the stem wire to the yarn balls, but I ended up using an even simpler method. I simply stuck a stem wire through the center of the yarn ball, bent it in half, and twisted it around itself. 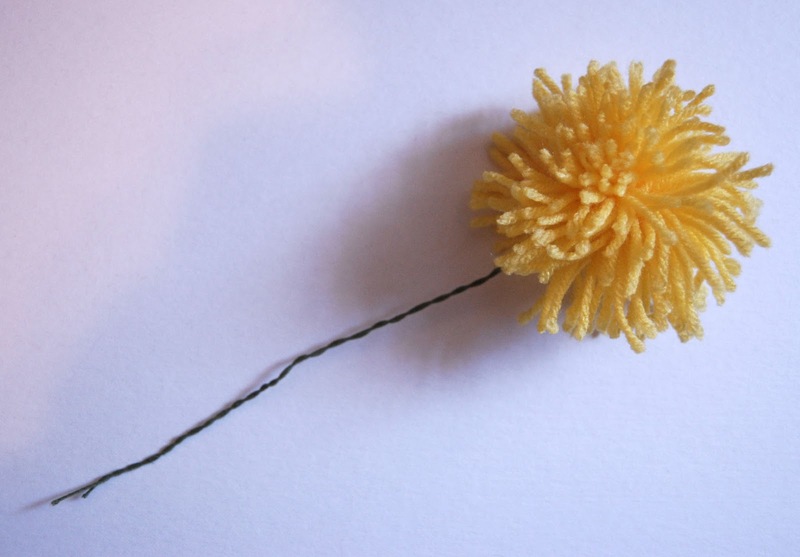 Stick stem wire through the center of the yarn ball. Bend wire in half and wrap around itself. Arrangement of five yarn ball stems. The next step was to wrap the jute around the mason jars. 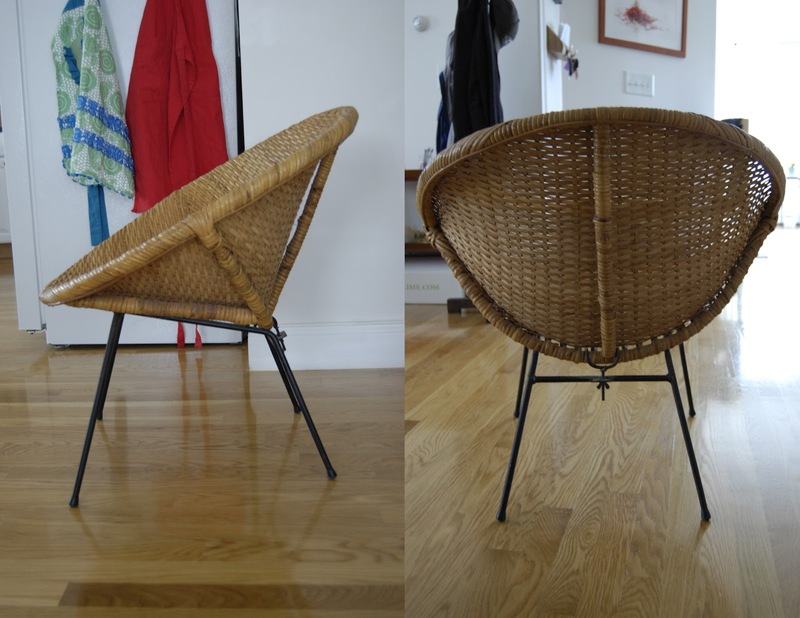 Partially, I chose to do this because I like that look, but it was also a functional decision - the jute would strategically conceal the mess of stem wires wrapped around themselves. 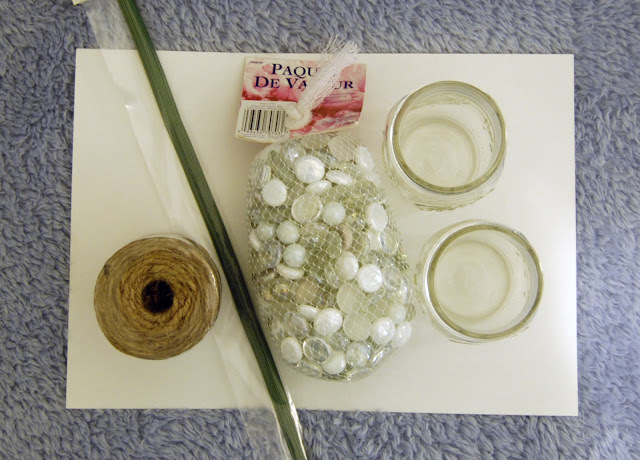 To wrap the jars in jute, I followed the same method I used to create wine and beer bottle vases. I simply used Elmer's glue to attach the jute to the mason jars - it creates a surprisingly strong and effective bond. Each jar took about half an hour to wrap, and I only wrapped them half way. With the mason jars wrapped in jute, and the yarn ball arrangements complete, all I had to do was stick the stems into the jars and call it a day. But to make my centerpieces a bit more shiny (and to stabilize the stems inside the jars), I added the pebbles/marbles to the bottom of each jar, just filling high enough to reach the jute level. 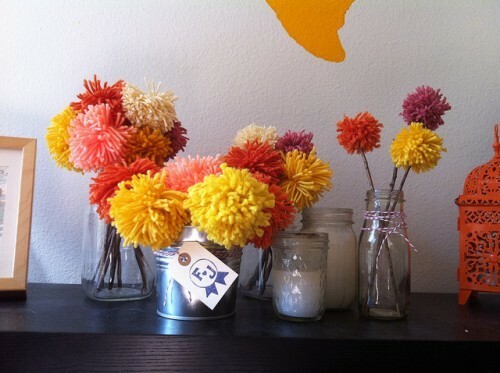 Then, I FINALLY put the yarn balls into the jars, and my centerpieces were complete! 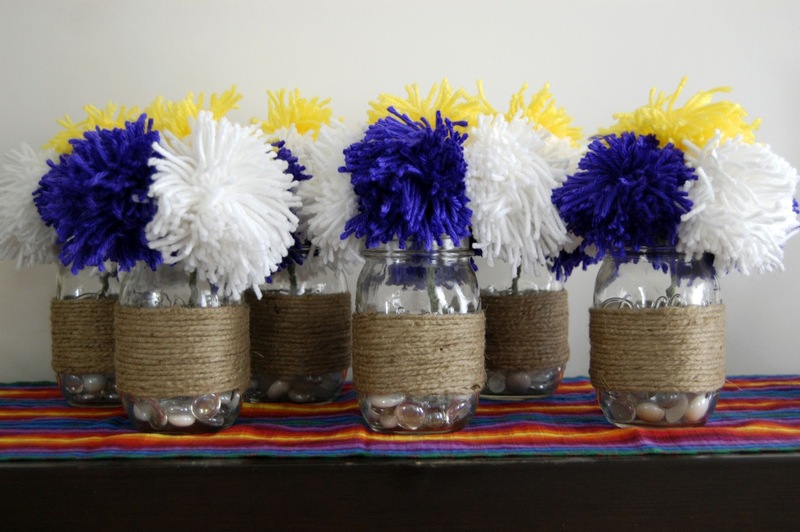 A complete yarn ball / mason jar centerpiece! Whew! Those centerpieces sure saved us a ton of money, but they took a really long time to make. So if you are thinking about DIYing something similar, I would recommend budgeting your time wisely. As for cost, all six centerpieces cost me less than $40 total to make. Talk about a bargain!